In Australia, it is heading into that time of year again where you might want to get the feet out of their shoes and socks. I like to do a foot peel from time to time in spring and summer. I’ve used Milky Foot before – it is usually $25+ where I live, so when I saw Softsole Express for $8.99 in Priceline, I thought I would give it a try. I found it to be slightly less efficient than Milky Foot but at that price you can nearly have 3 of them for the price of one Milky Foot. You have to leave it on for longer than Milky Foot. I would buy Softsole again. Weirdly it cannot be found on the Priceline website. Maybe that is a lack of talent on my part, though. 1. You need to get yourself organised before you put these things on your feet, because walking will be virtually impossible in fact it is downright dangerous. Use the bathroom first. Have everything you are going to need for the next 60-90 minutes handy eg water, your cup of tea, a snack, whatever. Make sure your phone is nearby. 2. If you have a spare pair of older socks which you don’t mind if they get the solution on them, you can put socks on over the booties. This will not enable you to walk safely, but it will keep your toes warm if it is a cooler day. 3. 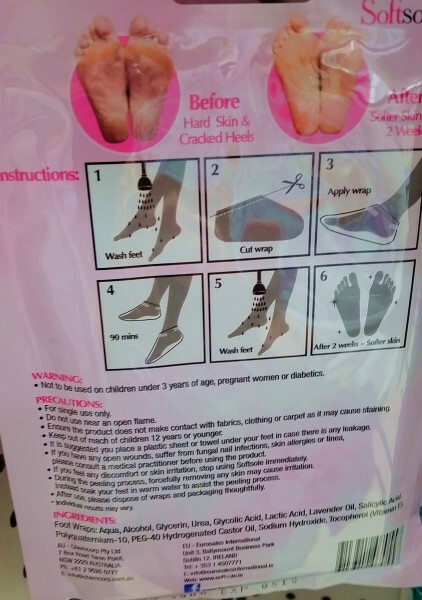 Keep your feet flat on the ground while you have the treatment socks on, otherwise you may notice some solution begin to leak out of the back. 4. After the treatment moisturize your feet twice to four times a day for the first few days as you will get a better result this way. It can take 3-4 days for the skin to begin peeling off. You will probably notice small bits coming off to begin with usually on the underskin of the toes. 5. Once your feet start peeling, if you want to speed up the process a little you can soak them in hot water with some peppermint oil added. 6. Don’t do this treatment if you have a special event coming up in the next couple of weeks where you will have your feet out on display. The peeling can happen for 2-3 weeks. Here is a review of the product you can read, and also the Softsole website, if you want to know more. Milky Foot is excellent and worth a try but at the price you will likely only want to do it once over the summer. That is not a bad thing because you don’t want to do a foot peel more than once a month. Here is the Milky Foot website. Between the two – softsole smells a lot better than milky foot does. The softsole packet is less optimal than the milky foot one is – it is more prone to splitting on the top. I could walk very carefully with the softsole packet on, I could not with the milky foot one. I think there is a lot more liquid in the milky foot packet. My Korean friend tells me these treatments are super popular in Korea. My Chinese Aunt tells me these treatments are very popular in China. A couple of years back Milky Foot did a big advertising drive here in Australia and that is where I first heard about them. Oo intriguing. Never heard of either so something to look out for. Interesting. 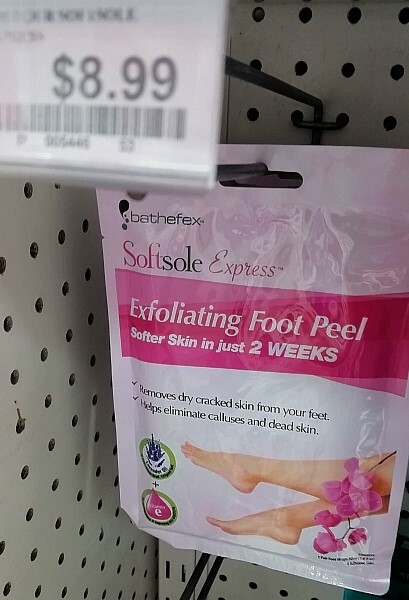 I’ve never heard of a foot peel, either. I am both fascinated and horrified by these things! Agree that you’d have to time it just right. I’ve thought about trying these, but the milky foot package warns of adverse reactions with sensitive skin and since I do get reactions from things like perfumed soaps etc, I’ve decided not to risk it. I’ll just live with the calluses. I’ve never heard of either of these. I wonder if there are version of this in the US and not by the same name. I will have to look. Oh, river, adverse reactions! Maybe I will reconsider. It is end of summer here, so I have a while to investigate. This sounds like fun! I might look around for it.